The wood of Paulownia is as valuable timber for the manufacturing of furniture, musical instruments, in boat and aircraft construction and many other areas where an aesthetic and light wood is in demand. Due to the stability in accordance to its low weight, paulownia wood is considered as the "aluminum" among the wood species. In addition to the extraordinary properties as high grade timber, paulownia wood is also suitable for biomass production due to its rapid growth. (Link to: Paulownia wood; energy wood). The biomass produced can be utilized not to only promote energy use, but also serves as a basis for the production of wood-based materials. Compared to poplar and willow biomass growth of Paulownia plantation is up to 30 percent higher. Appearance Paulownia forms a light wood, with a delicate honey-yellow to light gray color. Its surface is characterized by a silky shine. The characteristic grain of the wood is particularly eye catching due to its broad annual growth rings. Flash point The flash point of paulownia wood is with 420 ° C about half time higher than that of ordinary forest woods (270 ° C). For the energy use as firewood such a high flashpoint plays only a minor role, but it makes the wood interesting for applications, where increased fire protection is required. Weight With an average weight of only 310 kg per cubic meter Paulownia forms one of the lightest woods in the world. In comparison, our native oak lies at about 580 kg per cubic meter and even our currently as lightweight known spruce gets still at 470 kg. In spite of this low density Paulownia offers a high stability, the wood is preferably used in areas in which priority is given to weight reduction. These include the shipbuilding, aircrafts and construction of mobile homes and caravans. Surface Due to its low density, the wood has a relatively soft surface. This can indeed be crafted very well, but also makes it prone to scratches and little damages. To gain the suitability for everyday use, such as a sufficiently hard surface, a finishing step and additional treatment is necessary. Drying Depending on how the wood is to be processed, it can be dried both on the fresh air and in drying chambers to quickly reduce the residual moisture content to about 10-12%. 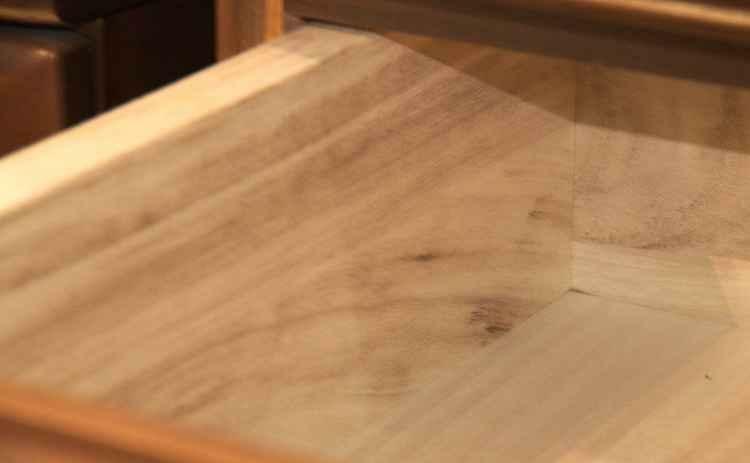 Another feature of paulownia wood is in its small degree of remoisturization. Once Paulownia is dried, it hardly takes up water again. In contrast to other types of woods, Paulownia is therefore an extremely dimensionally stable timber. The typical "working processes" of the wood - known as swelling and shrinking - remain absent from here. In addition to the good sound properties of Paulownia this is one of the aspects decisive for the use of wood for various musical instruments. Since water is the transport medium for odors and flavors, the paulownia timber assumes no alien smells and tastes. Because it also has no smell on it’s own, Paulownia is therefore also preferably used for production of packaging material in the food and beverage industry.